Fears are part of your experiences that you have no control over. Your unconscious mind stores all your memories, experiences, beliefs, skills, and images you’ve seen. Even the thought of spiders or snakes may make your skin crawl. Other deep-rooted fears also come out when your unconscious mind is triggered. Take the following picture test to reveal what your unconscious mind fears the most. Picture Test: Discover What Your Unconscious Mind Fears The Most! 1. Caterpillar. Seeing the Caterpillar first means you may have the subconscious fear of spirits, ghosts, or you might be really afraid of falling asleep after you watch a scary movie. If you have experienced paralysis before, you may still be afraid of going through it again. 2. Butterfly. 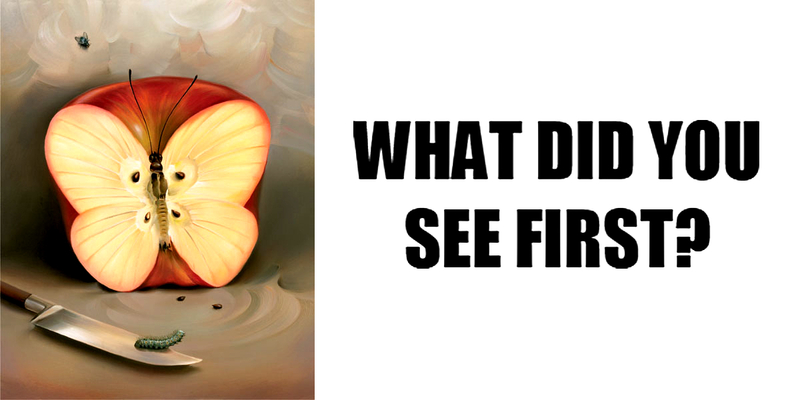 If you see the butterfly first, it means that subconsciously you are afraid of a betrayal. Maybe, this is due to your previous experiences of being cheated or back-stabbed by a friend or someone you loved, and no matter how much you try the fear still comes out. 3. Knife. If it is the knife that you see first, you may have a subconscious fear of getting a terminal illness. You may be afraid of suffering or may worry about dying any time. 4. Apple. Seeing the apple first is a striking one because it means you may have a subconscious fear of death, not your own death, but that of your loved ones. You may have experienced the same thing before and going through it all over again may be too much for you. Whatever fears may be lurking in your unconscious mind, know that it’s only a fear. You may have no control over it, but you have full control over yourself and your reactions to it. Believing that everything has a reason and a purpose is the best way of facing your fears head on.